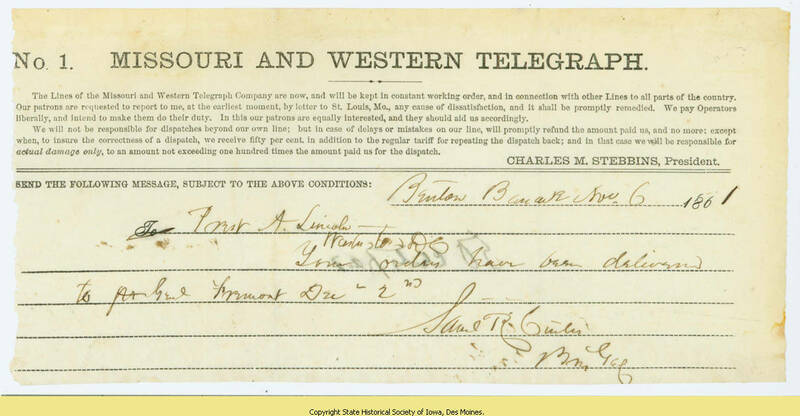 Telegram from General Samuel R. Curtis to Abraham Lincoln reporting delivery of an order (Special Order 18) replacing General John C. Fremont with General David Hunter as Commander of the Department of the West. November 6, 1861. Lincoln's order followed Fremont's failure to rescind an order emancipating the slaves of Missouri and imposing martial law on the state. Autograph Letter Signed. Original scanned at 600 dpi w/ sRGB color space.